American artist Allyson Vieira creates sculptural installations endowed with formal austerity and material roughness, evoking disparate modes of ancient Greek and Roman art. THE ANNOUNCEMENT card for New York-based artist Allyson Vieira’s first museum exhibition, at the Kunsthalle Basel last fall, featured a photo she took in Athens (she visits Greece every few years), depicting a section of the ancient city walls mortared into place with cut-stone remnants from other architectural sites. Referring to reused elements or spolia such as these, Vieira (b. 1979) has observed that “objects persist through multiple slices of time.” (The Latin term spolia originally referred to spoils of war displayed by Roman generals but is now used much more generally in architecture and art history.) She thus echoes art historian George Kubler, whose study The Shape of Time: Remarks on the History of Things (1962) has greatly influenced her, as it previously did Robert Smithson, Robert Morris and other 1960s-era Conceptual and Minimalist artists. Indeed, her Kunsthalle Basel show was titled “The Plural Present,” after the last subchapter in Kubler’s book. Just before the Basel exhibition, Vieira—who received her BFA from New York’s Cooper Union in 2001 and her MFA from Bard College, Annandale-on-Hudson, NY, in 2009—also paid homage to an Athenian structure in a show at Non-Objectif Sud, a farmhouse venue in Tulette, France, that hosts artists for exhibitions and residencies. Here she showed Site (37.9714’N, 23.7262’E, 01/14/2013,12:15-12:36), 2013, a video documentation of the Parthenon under repair. Workers go about the task of refurbishment, grinding on fluting and hammering on stone, while tourists pass back and forth in the lower portion of the frame. The restored areas of the columns (carefully inset replicated fragments culled from the same quarry as the original marble) are crisp and white in contrast to the weather-and pollution-damaged antique remains. The video can be read as a literal illustration of Smithson’s comment that construction sites are ruins in reverse. The web of scaffolding that interpenetrates the building recalls another ardent Classicist, Piranesi, whose 18th-century “Carceri” (Prisons) prints depict vast, labyrinthine, multi-level spaces with crisscrossing stairways. Site was shown on a wall-mounted flat screen, near a maze Vieira constructed from metal wall studs (Labyrinth [France, 19/04/2013, 21:12], 2013), inside of which the viewer encountered one of the artist’s “Clads” (2012-ongoing). In architecture, the term “cladding” refers to a unit of insulation or protection attached to the outside of a building, such as the marble on ancient temples or the shingles on Midwestern houses. Vieira’s “Clads,” however, incorporate detritus that she collects while realizing a project. The works generally consist of a metal-stud frame with an attached plaster wallboard backing, onto which—using plaster and/or masonry cement—she adheres drywall scraps, food containers, plastic gloves and other studio cast-offs and surplus materials. These reliefs, which resemble sculptural steles, are either hung like pictures or, often, propped against a wall in regimented order. Their surfaces tend to be heavily reworked, bearing evidence of grinding, planning and chiseling, and their elements reflect the artist’s attention to composition. The “Clads” typify Vieira’s art, which explored the dialectic of destruction and construction, and the ways in which items from different time periods coexist, with the past informing the present and vice versa. They seem an attempt at aesthetic reclamation, inviting the viewer to respond artistically and historically to the construction debris we pass on city streets every day. VIERIA’S FIRST SOLO exhibition, in 2006 at Small A Projects in Portland, Ore., featured ink drawings that reference passages from 18th-century historical paintings by artists such as Hubert Robert, Platonic installation of geometric forms, paper tube sculptures resembling columns and striped works on paper evoking early versions of the American flag as allusions to the American revolution. These works were the by-products of Vieira’s research into the origins of democracy, spurred by the crisis of George W. Bush’s administration. She also studied the history of plaster, especially its role during the Enlightenment. Plaster casts of ancient Greek and Roman sculpture and architecture usually formed the core of period collections during the 17th and 18th centuries, serving as reminders of the great humanist triumph of the Greeks. Johann Joachim Winckelmann—who, in 1764, wrote the first history of ancient art—believed that democracy prompted an unrivaled artistic excellence in 5th-century BC Athens. With this new system of government came the artistic triumph of naturalism, as manifest in the development of contraposto, the classic pose in which the body of a standing figure is slightly turned, with one foot placed forward, conveying a capacity for lifelike movement. Winckelmann and others praised the whiteness of plaster casts, which became the preferred vehicles for contemplating the idealized past, more so than the time damaged original marbles. “Fresh white plaster,” as critic Sven Lütticken notes in discussing Winckelmann, “seemed to transubstantiate the flesh and turn it into its own idea.” To Neo-Classical artists it had a sculptural purity. Vieria taught herself to work with plaster largely through viewings of the 2007 film Josephsohn Sculptor by Matthias Kälin and Laurin Merz, a documentary on the now-deceased sculptor Hans Josephsohn, swho was comfortable adding dried plaster pieces from other works to his wet plaster sculptures in process. Vieira’s first solo exhibition in New York, at Laurel Gitlen gallery in 2010, originated as a six-ton mass of plaster mixed with concrete and drywall. With the help of her interns, she cut the sculptural mass into 18 vertical slabs, each about 64½ inches high and 16 inches wide (the first dimension being the height of the artist, the second being the standard width between wall studs in US construction), using drills, chisels and a refitted 5-foot two-person handsaw. For the exhibition, titled “Ozymandias,” after the builder-pharaoh Ramses II and the Shelly poem inspired by an enormous statue of him in the British Museum, Vieira placed the verticals equidistant from one another in an installation called If I was a…but then again, no (1-18). The signs of human intervention left on the slabs’ surfaces—rust-colored runs, crumbled plaster, frayed drywall paper, deep drill-holes—exemplify Kubler’s definition of objects as “fossilized actions,” or activities preserved in material and form. Near this room-filling installation stood Destroyer of Empire (2011), a tank containing a live octopus. The plaster monoliths married a classicism of rough-hewn remnants with a minimalist system of ordering. They also seemed like a visual equivalent to the sound of Vieira’s favorite band in high school, the German noise group Einstürzende Neubauten, which employs things like power tools and scrap metal as instruments. The name means “collapsing new buildings,” referring to cheap postwar German housing. The centerpieces of several of Vieira’s subsequent installations have been freestanding semi-abstracted versions of caryatids—columnar female figures used as building supports since antiquity (they can be found, for example, on the Erechtheion, a small temple on the Acropolis). 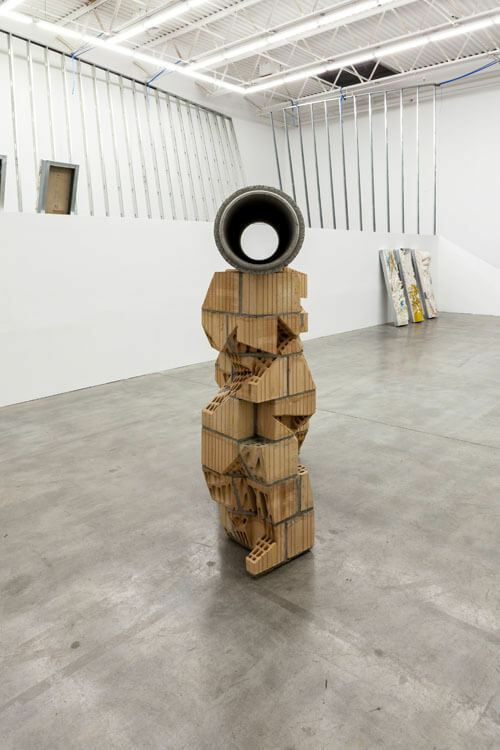 Vieira’s exhibition at Lauren Gitlen in 2013, titled, “Cortège,” featured four pairs of caryatid-like forms form a series called “Weight Bearing,” begun in 2012 using live models. Made of Stacks of drywall pieces mortared together with plaster and cement, the quasi-figural elements appear to have clunky, muscular limbs and to be standing in controposto. In each pair, the vertical forms, positioned two or three feet apart, support a horizontal steel beam, recalling basic post-and-lintel structures. Three other pairs from the series, this time made from cinder blocks (and reinforced by cables and other surreptitious riggings in order to meet safety requirements), were part of a 2012-2013 project for the Public Art Fund at downtown Brooklyn’s MetroTech Commons. Vieira’s work in plaster, which she calls the “material of the three dimensional replication and dissemination of Classical imagery throughout Western Europe,” brought her to her current interest in contemporary building materials. She observes that old ruins are “mostly made of stone, and the same stone that the sculptures are made of, so we have this continuity of material between architecture and sculpture that doesn’t necessarily exist anymore.” She finds this continuity compelling and thus has set out to make sculpture—and semiclassical sculpture at that—from materials used in the building trades today. “THE PLUARL PRESENT” was one of Vieira’s clearest yet most metaphorically complex exhibitions to date. After appearing at the Kunsthalle Basel, it traveled to New York’s Swiss Institute in revised form. Both incarnations included site-specific elements. The Kunsthalle Basel had The Long Walls (2013), two gallery-spanning openwork walls made of 20-foot metal studs insterted into tracks on the top and bottom and strapped to sprinkler pipes to yield a gradual curve. The Swiss Institute offered The City Wall (2013), a configuration of metal-stud walls, also twisted, that circumscribed the main gallery. In both cases, the steel frames were like colonnades endowed with a somewhat parodic classicism, their torque recalling the Parthenon’s slight curvatures, which were meant to dispel rainwater and to correct the distortions of the eye. The centerpiece of both installations was Beauty, Mirth, and Abundance (2013)—three forms made from Swiss Modul brick (the cheap, terra-cotta-colored building block widely used in rebuilding European housing after World War II. These “Figures” were semi-abstracted from The Three Graces at the Metropolitan Museum of Art in New York, a Roman copy of a Greek original from the second century BC. The Roman Graces are now headless. In Vieira’s translation, their “shoulders” support a concrete pipe. Vieira realized Beauty, Mirth and Abundance while in residence at Sitterwerk, in St. Gallen, Switzerland, and institution that includes a foundry and oversees the estate of works by Josephsohn, who cast his plaster sculptures into bronze there. On the lower level of the Swiss Institute, Vieira showed Site (37.9714’N, 23.7262’E, 2013, a straight-shot, real-time video portrait of the One World Trade Center tower under construction on a clear spring day. An adjacent gallery, set up as a camera obscura, featured an inverted version of the footage as it played in the other room. Constructing the new building on the site of the 9/11 ruins is in the spirit of spolia, which express a wish to retain the memory of a shared heritage, to affirm victory (military or religious), renewal and continuity. Also on view at the Swiss Institute was an assortment of Vieira’s “Clads”: seven were placed in a row on the upper level, three appeared on the ground level, and one was installed in the foyer of the exhibition space proper. This last piece is composed mostly of cut-offs from the wall studs used in City Wall, though it also features a single isolated work glove, tucked behind the cluster of metal. The work calls to mind Giorgio de Chirico’s painting The Song of Love (1914), in the permanent collection of New York’s Museum of Modern Art. De Chirico’s painting depicts, at center, an oversize glove pinned to a wall next to the head of a Classical statue; around them are a sphere, a building with a colonnade and, in the distance, a locomotive. Realized in the first year of the First World War and bearing overtones of melancholy and futility, the painting seems an index of themes also explored by Vieira: the sphere conjures Platonic ideals; the statue head evokes not only antiquity but also the Enlightenment idealization of humanist rationality and the Romantic aestheticization of the antique fragment; the glove conveys modern construction processes and materials; the train suggests departure, the passing of time. The poet Elizabeth Bishop called the 20th century “the worst so far,” as Robert Morris noted in an article in this magazine in November 1989. The current century appears to be no better, offering destruction by terrorism and natural disasters accelerated by humankind. In Vieira’s work, sculpture and architecture, antique and contemporary, merge in a way that make objects appear like future artifacts—signs of an empire that has long been destroyed. Details of Vieira’s working procedure were discussed with the author in New York and by phone, September-December 2013.